The Madhya Pradesh High Court today quashed the FIR filed against Madhya Pradesh Governor Ram Naresh Yadav in connection with the Madhya Pradesh Professional Examination Board (Madhya Pradesh Vyavsayik Pareeksha Mandal or ‘Vyapam’) scam holding that the police is prohibited even from registration of FIR in respect of cognizable offence against the Head of a State as envisaged in Article 361 (2) of the Constitution. The Special Task Force (STF) had filed an FIR against Governor Yadav and others on February 24, alleging his complicity in a forest guard recruitment exam conducted by the MPPEB in 2013. The FIR had been registered under Sections 417, 420, 467, 468, 471, 477A and 120B of Indian Penal Code read with Section 65 and 66 of Information Technology Act, Section 7, 13 (1D), 13 (2) and 15 of the Prevention of Corruption Act, 1988 and Section 3 (d), 1, 2/4 of M.P.Manyata Prapt Pariksha Adhiniyam, 1937. The multi-layered scam saw candidates rig examinations for admission to colleges and recruitment in government jobs through scamsters who employed imposters to write test papers, manipulated sitting arrangements and even supplied forged answer sheets. Yadav has been accused of writing a recommendation letter favouring five candidates to facilitate their selection as forest guards by resorting to unfair means in the ‘Vyapam examination’ conducted by the Madhya Pradesh Professional Examination Board. 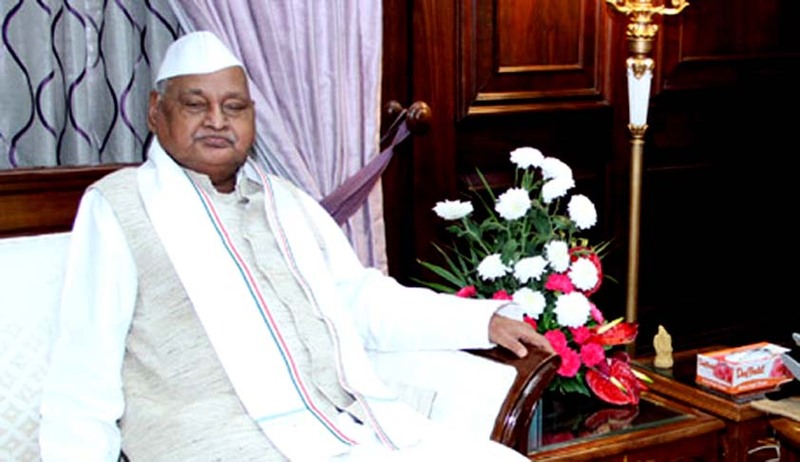 Assailing the registration of a FIR against him, Madhya Pradesh Governor Ram Naresh Yadav had contended that no criminal proceedings could be initiated against him as long as he was in office. Appearing for Ram Naresh Yadav in the High Court, his Counsel M/s Ram Jethmalani, Adarsh Muni Trivedi and Rajendra Pateria had argued that initiation of criminal proceedings against the Governor was against the provisions of Article 361 (2) and Article (3) of the Constitution which conferred immunity from prosecution during their term in office. Accusing the STF of acting under “political pressure”, Yadav had also said in his petition that the FIR was registered by STF adopting pick and choose method and not following the procedure prescribed under the law. He further contended that the accusations against him appears to be false and frivolous prima facie, since it is based on the statement given by an accused who has already been in jail for more than one-and-a-half years since 18 July, 2013. He also pointed out that the Excel sheet containing his name, which was submitted by Congress General Secretary Digvijay Singh to the Special Investigative Team (SIT) mandated to keep a watch over the STF, could be "forged". It was inter alia urged in the petition filed by Governor Yadav that no FIR could have been registered against the petitioner without a preliminary enquiry for ascertaining the genuineness of the information and whether it amounts to commission of cognizable offence. That was mandatory as has been held by the Constitution Bench of the Supreme Court in the case of Lalita Kumari Vs. Government of U.P. and others. The petitioner had also urged in his petition that the FIR does not disclose that the informant had personal knowledge of the factum of Governor having made any recommendation nor the informant has mentioned that the Governor had communicated with him in that behalf. On the other hand, the allegations in the FIR refer to some intermediary and the statement made by unknown and undisclosed intermediary. That cannot be used to implicate the Governor of the State. The State on the other hand had contended that registration or institution of FIR in police station cannot be equated with criminal proceedings in any Court and so understood the immunity granted under Article 361 (2) of the Constitution is not attracted. In other words, registration of FIR in respect of cognizable offence against the Governor and more so in respect of his acts of commission or omission which are not in furtherance of powers and duties of the office of the Governor or purporting to have been discharged by him in exercise and performance of these powers and duties, can be said to be protected or immunity granted in that behalf to the Governor during his term of office. Considered the rival submissions, a division bench of the Madhya Pradesh High Court comprising Chief Justice A M Khanwilkar and Justice Rohit Arya opined that the primary question is about the extent of immunity bestowed on the Head of a State be it President or Governor in terms of Article 361 of the Constitution of India. Endeavouring to give meaning to the words used in Article 361 of the Constitution, namely- “criminal proceedings”, “whatsoever” and “institution in any Court”, the Court said that the plain language of Clause (3) leaves no manner of doubt that the arrest or imprisonment of the Head of a State during his term of office pursuant to any process, is “completely” prohibited. The Bench framed what it called the “moot question” before it thus: whether “registration” of First Information Report under Section 154 of the Cr.P.C. in respect of commission of cognizable offences under I.P.C. or other penal laws, against the Governor during his term of office, by name, is also prohibited within the sweep of this Clause?, and proceeded to answer it in the affirmative. Thus, accepting the contentions advanced by Governor Yadav, the Division Bench quashed the FIR against Governor Yadav and observed in its verdict delivered today that purposive interpretation of the expansive words “criminal proceedings whatsoever” conjointly read with “instituted in any Court”, is imperative to uphold the spirit of Article 361 in particular Clauses (2) and (3) thereof and to subserve and further the intent of the framers of our Constitution of providing “absolute protection” to the Head of a State during his term of office. The Bench said, "While dealing with the primary question of extent of immunity and privilege extended to the Head of a State, during his term of office, which answers the jurisdictional fact, we proceed to quash the impugned FIR against the petitioner (Governor) on that count alone, with liberty to police to proceed in accordance with law, after the petitioner ceases to be the Governor." The Court however made it clear that the STF could continue its investigation into the case in which the FIR was lodged against the governor and could also record his statement. "For, the immunity and privilege is only during the term of office. At the same time the immunity and privilege extended to the Governor will not impair or whittle down the powers of the police to investigate the criminal case registered against other accused who cannot claim such privilege and in the process, record statement of the petitioner, if required,"
The court, however, asked the STF not to undermine the "majesty of the office of the governor" while proceeding with the investigation. "The police, however, must take all salutary precautions and observe circumspection while recording statement of the petitioner in the course of investigation, so that the majesty of the office of the Governor of the State is not undermined in any manner," the Division Bench said.